Can you believe this is the last but one block the Round the Year Block of the Month Quilt? I was in two minds whether to include this beautiful traditional pieced block in this quilt, where all the other blocks are majorly paper pieced. You decided it for me and I couldn’t be happier! I first made up this block almost 4 years ago, when I was quite new to quilting, using the winding ways block. I drafted it using this great tutorial by Kathy Somers. Partly pieced by hand and partly by machine, it finished at 4.5″ including the seams! I plan to include it in the next major project I embark on, a quilt made with miniature 4″ blocks including, perhaps, a few Dear Jane and Nearly Insane quilt blocks and some of my very own. To get back to Block Fifteen, it finishes at 18.5″ square with the seam allowances. The inset circle is 15″ plus 1/2″ seam allowance. I have drafted this on free quilt design software Quilt Assistant, which I have used to draft all the blocks of this quilt! The block looks difficult, but the curves are really gentle and if you cut accurately, and pin carefully, it is a breeze to piece! This block will be appliquéd to the background square. You will need a 19″ square in Fabric#1 . 1. Print the Instructions File and Templates File on A4 size paper with your printer settings on 100% or Actual Size in portrait mode. I used freezer paper to print the templates. I just press it on the fabric and cut around it! To print on freezer paper, cut A4 size freezer paper and lightly iron the edges on to regular printer paper. Print as usual on freezer paper side . Use a paper knife to separate. Prepare the freezer paper for printing by pressing the edges lightly on regular printing paper. 2. Cut the templates A, B and C . I cut 2 sets of the templates to make the fabric cutting faster. You could also print them on ordinary paper, paste on stiff card and cut out to make reusable templates. Please starch your fabric before cutting, to ensure accuracy and crispness in your block. As you cut the fabric, use the alignment markers on the templates to mark the centre of each side of the fabric pieces. I have made notches as markers. I also marked the corners with a pencil on each of the pieces. I learnt the hard way that you save a lot of heartburn by taking time at this stage. Follow the colour diagram and arrange all the fabric pieces where you do not need to disturb them. The block will be pieced in different sections, numbered 1 to 7 here, as shown here and then assembled. Please follow pressing instructions, they are very important in this block! Trust me, I have made a whole quilt with these blocks. Referring to the colour pattern, align the curved side of B on top of concave side of A, for all sets of A and B. Pin at the centre notch. I pinned them with the pin on the fabric and had to repin with the pin sticking out before sewing! Do not pin like this! The pin should face the other way, stick out! When piecing, you need only two pins. Match the blunt ends of the two pieces one at the corner where you begin, pin. The other pin is at the centre notch. Once you are past the centre notch, use a pair of small forceps/ tweezers to gently align the fabric and finish the curve. Piece all A-B sets. Press seam towards B. Add piece C to one set of A-B in each of the sections # 1, 2, 4, 5, 6 and 7. Place C on top, match notches, pin. The other pin aligns the corner points at the narrow end, where we begin the seam. Two pins – one at narrow end and other at centre notch. Do not skip on the pressing after each stage, if you want a pretty block. Sew other set of AB from the section to corresponding ABC just sewn. Again, begin with narrow end of C on top. You will have to change your machine needle settings; in my machine, ¼” seam is at needle setting 1.8, so I shift it to -1.8 when doing this step. The seam will be on the left and fabric on the right as you face the machine! Again, press the seam towards A.
finger press open the seam. Use a smaller stitch length, fix the thread ends. Finger press open. Join the corner B pieces to Sections#6 and #7 and press seam open. All our sections are pieced! First we assemble the centre square. (This is the basic winding ways block!) This is the crucial step which will determine the beauty of the block. Carefully pin Section 3 centre seam to centre of Section 1. Do not be in a hurry here! Next, match the notch on the long side of C to notch on A and pin. Start sewing from centre outwards on one side, then the other. This way you can check if your centre points are matched or not! Press seams toward A, away from the narrow section 3. Similarly pin Section#2 to just assembled Section#1-3 and sew. Again press seam away from Section#3. Not perfect . I ripped a few cms and re-did it! Now we sew Section#4 and #5 to centre square 123. Match notches and corresponding seams and pin. The seams are REALLY bulky and you may need to use a lot of maneuvering to get them right! We are on the last step already! AS usual, match all intersecting seams and notches and join sections#6 and #7 to 12345. Press seams open. I am quite happy with my block! All that remains is to appliqué it to the 19″ background square and trim it to 18.5″. I am planning to use the freezer paper method to do so. 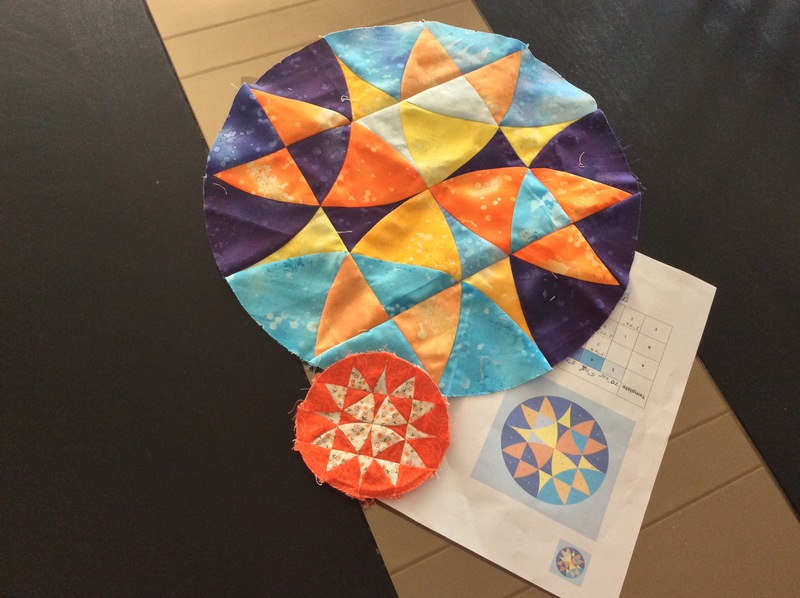 What is your favourite method to appliqué a circle to a square? I would love to see the blocks you come up with – on my Facebook page. The pretty, pretty Winding Ways Wheel Block! The sixteenth and last block will be up on May 1st! Like I told you, my mind is already on a fast forward mode, planning what is coming up next – perhaps, to a quilt with miniature blocks?! I do hope I will have the patience to finish this Round the Year quilt before that! So here are the files in PDF format. To be able to view these, you need Acrobat Reader which you can download for free. I am super excited to be sharing with you what has been keeping me away from the Round the Year BOM Quilt! It is my entry for the Husqvarna Viking India, PFAFF India & Handi Quilter India – Quilt Competition 2015 for Indian quilters from around the world! The topic was The Joy of Flowers; it is amazing how different are the various interpretations of the theme! I do hope you will head to the Competition FACEBOOK PAGE to see the awesome entries posted there so far. You can also see them on my Patchwork of My Life page. My entry is called `Seasons in the Sun’ … more can be revealed here only after the results are announced at the end of this month. However, if you want to see what I made last year, this is where you go! Meanwhile, after relaxing for over a week to recover from a flurry of day and night quilting activity, I have started cutting the fabric for Block 15 of the quilt! I hope to have it up on 15th April. Any guesses as to which one it will be? 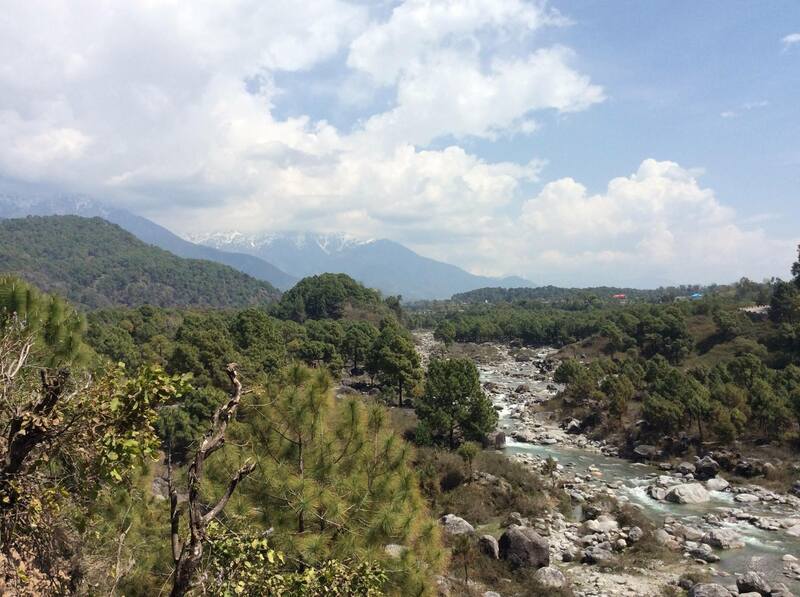 Before I sign off, I must share with you a picture of the beautiful place in the Himalayas, where I took a holiday!